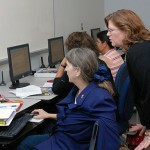 The D2L Brightspace is SFSC’s learning management system, accessible through the “My Courses” tab in Panther Central. Similar to Blackboard and Web CT. Enables students to e-mail their instructors. Participate in a discussion board. Aids instructors by grading quizzes. For assistance with usernames and passwords, contact the Educational Technology Support Department at 863-784-7017.